-- Select a Size -- Small - Out of Stock! Medium - Out of Stock! Large - Out of Stock! X-Small - Out of Stock! 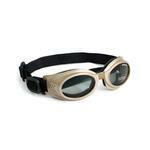 Doggles Originalz Chrome Frame dog goggles are designed to protect dogs' eyes from the sun's harmful rays, flying debris, wind, rocks, or bugs. Your dog can't tell you his eyes hurt, so be proactive and help your dog's eyes. For eye protection or fashion, your pet deserves the very best! Originalz offer 100% UV protection, shatterproof and anti-fog lenses. Originalz style is the style that started it all. This style has a full frame and fixed lenses (not interchangeable or replaceable). The lens cup is more suited to dogs with less protruding eyes and eyes that are closer together. Doggles also come recommended by Vet Ophthalmologists to protect their patients in all types of situations and also after some types of eye surgery. 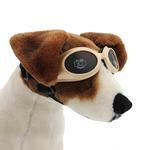 And don't forget that these Chrome Frame and Smoke Color Lens Doggles are in the height of dog fashion! 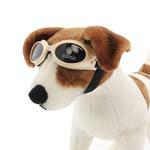 Note: The Originalz DO NOT have removable lenses and are NOT recommended for dogs whose eyes protrude. The ILS style is better suited for these breeds. Doggles Originalz have a lens cup that is more suited to dogs with less protruding eyes and eyes that are closer together. The frame is the measurement from one corner of the frame to the other (outside corner of the eye to the outside corner of the other eye across the face). Doggles - Originalz Chrome Frame with Smoke Lens Customer Photos - Send us your photo! Apollo and Zeus couldn't wait to try on their Doggles as soon as they arrived. These brothers are ready to cruise! Doozie Pots loves his doggles. He's truly a biker dog and love his doggles. It was a chilly day riding but Buddy is snuggly warm. He is from the pound, and is very friendly with children, and women, and is very calm. He loves to ride the motorcycles too. Jaya's wearing Doggles and Mutt Muffs… ready for any adventure, including jumping out of a helicopter! Milo always needs his doggles at the beach... even when he is inside- taking a nap! This is Brody multi-tricking, he is balancing his rubber ducky on his head while holding a sign in his mouth while wearing his Doggles and his favorite pair of ducky slippers. Teddy is a happy-go-lucky guy that loves to wear his doggles. I'm a chic magnet in my Doggles! They think I'm their Prince Charming! In a bed of flowers she rocks her doggle shades. Pepper loves wearing his Doggles whenever he wants to feel the wind in his hair! They protect his eyes from glare and debris and he knows he looks good in them too! Sampson is a 8 month old Cavilier King Charles who loves to ride and gets all excited when it is tine to gear up. Ed is an amazing Corgi. An absolute clown and love bug. Life is not the same since Ed. WE LOVE YOU, ED! Who's the coolest dog in the park? Doggles protect Atticus Beane's eyes from harmful rays. Loving the wind in my face! Chester wearing his doggles getting reay for our lake vacation. Maurice celebrated his 5th birthday in style by showing off his new Doggles! Sammy loves his Doggles for his motorcycle rides! Thanks so much! I Love Watching "Surfers" here @ Ocean Beach, S.F. Ca. HEY DID ANYONE SEE MY DOGGLES????? Kody says "My future's so bright, I gotta wear Doggles"
Don't you just love my new glasses? Mr. Handsome sporting his Doggles... Thank You BaxterBoo! Poncho strutting his cool Doggles. He absoluting loves showing off his new glasses. Check out Sophia and Oliver it is hard to tell who loves the Doggles more, thanks again to Niki, their photographer!! Sophia loves her Doggles, and she too was happy to see her favorite pet photographer 7 year old Niki. This means I get to go with! Max loves to ride with the top down wearing his Doggles! Could I be any cooler?!! Posted On 05/25/18 by Sonya S from Catawba, NC Yes, Sonya S recommends this product! Hope wears these while riding the wave runner with us. She looks super cute, they stay on, her eyes are protected, and eveyone comments. This color looks great with both her orange and yellow life vests. Posted On 05/18/17 by Amanda A from Australia , Yes, Amanda A recommends this product! My little puppy looks so cool in her Doggles sunglasses goggles! They sit quite comfortably on my puppies face & she can see where she's going ok.
Posted On 04/10/17 by Melanie T from Spanish Fort , AL Yes, Melanie T recommends this product! Cute as they can be! Perfect size for my 5lb pom. He is solid black so these doggles look so cool on him. Really do protect his eyes from the wind on our boat rides. The xs size was a little hard to find. So glad I found them here and they were a little cheaper than other sites too! I'm a very happy camper! Posted On 10/17/16 by Mary Ellen R from , WI Yes, Mary Ellen R recommends this product! Posted On 09/06/16 by Sue B from Port St. Joe, FL Yes, Sue B recommends this product! I didn't know if my dogs would like their doggles, but after the first attempt at wearing them, they decided they were ok. Now they wear them whenever we go in the pool or to the beach. Posted On 12/12/15 by Laura b from Ponte vedra , FL Yes, Laura b recommends this product! Posted On 06/08/15 by John L from , ID Yes, John L recommends this product! We are getting use to wearing the Doggles:) the purchase was very easy with super helpful people answering all of my questions. Posted On 04/10/15 by Maureen R from Plymouth, MA Yes, Maureen R recommends this product! I received the Doggles yesterday and they are great quality. Now if I can just get my dog to wear them! He has an eye disease so I really have to try hard to get him to wear them. Posted On 10/08/14 by ANNIE W from RINGWOOD, NJ Yes, ANNIE W recommends this product! I USED THEM JUST AS AN ACCESSORY BUT THEY WERE TRUE TO SIZE AND FIT PERFECT ON MY PUG!! Posted On 10/07/14 by ED from San diego, CA Yes, ED recommends this product! I've ordered this Doggles multiple times, not because they are not well made, but because they are an absolute necessity for my little Dude. Gives him added protection from his grass allergy, and when we go out for walks, it protects his precious eyes from debris cause by passing vehicles. 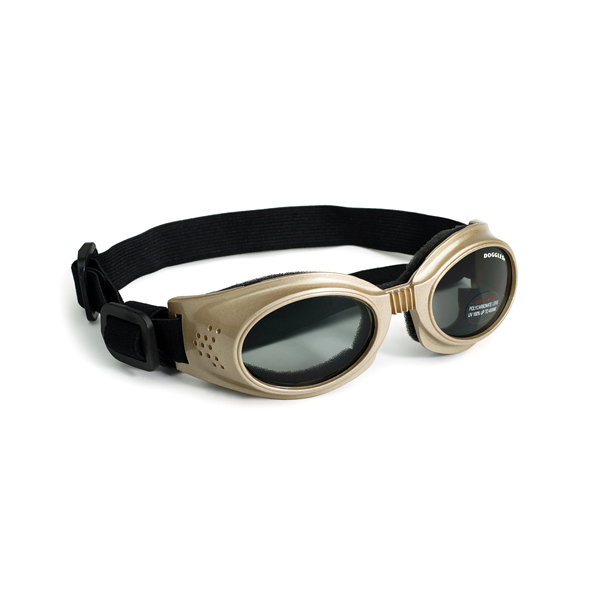 Unfortunately they don't have the blue original Doggles anymore, that one is one of our favorite. Mp lease bring back the blue one.